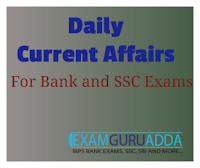 Dear Readers, we are presenting Daily Current Affairs for All Exams- 19th December 2016. 1. BJP led government ropes in Bollywood actress, Priyanka Chopra as the brand ambassador of state tourism. She will promote brand entity of “Awesome Assam”. 2. The six month old BJP government had gone on a celebrity hunt to promote Assam tourism. Chopra will visit Assam on December 24 and address international tour operators meet. 2. The right-hander remained undefeated at 303 at stumps, reaching the landmark in the 191st over of India's first innings at the M.A. Chidambaram Stadium . 1. Owing to Britain's recent Brexit-related problems and thanks to India's rapid economic growth, India has managed to overtake its erstwhile colonial master United Kingdom in terms of the size of the economy - the first time after nearly 150 years. 2. This dramatic shift has been driven by India's rapid economic growth over the past 25 years as well downslide in the value of the pound over the last 12 months. 1. The Union Government has decided to set up a single permanent Tribunal to adjudicate all inter-State river water disputes. This single body will subsume all existing tribunals for resolving grievances of inter-State water disputes in a speedy manner. It will be headed by a retired Supreme Court judge. 2. The Tribunal will also have more teeth as whenever it gives order, the verdict gets notified automatically. Until now, the Union Government was required to notify the awards, causing delay in its implementation. 1. The Union government has formed a high-level inter-ministerial task force to look into all the strategic aspects of Indus Water Treaty (IWT) with Pakistan. Mandate of Task force is to take all important strategic and policy decisions. 2. Thus, it will be an all-powerful body which will take decisions regarding the treaty. It will be headed by Prime Minister’s Principal Secretary Nripendra Mishra. 3. Besides, other members of it include NSA Ajit Doval, foreign secretary S Jaishankar and secretaries in ministries of finance, power, water resource and environment. Besides, chief secretaries of Punjab and Jammu and Kashmir are invitees in the task force. 1. The Union AYUSH Ministry has launched ‘Swasthya Raksha Programme’ to promote health and health education in villages. 2. The programme was initiated through Central Council for Research in Ayurvedic Sciences (CCRAS), Central Council for Research in Homoeopathy (CCRH), Central Council for Research in Unani Medicine (CCRUM) and Central Council for Research in Siddha (CCRS). It was launched by AYUSH Ministry in October 2015. 1. The world’s first cloned goat bearing superfine Cashmere wool was born in north China’s Inner Mongolia Autonomous Region. 2. The goat will be raised in a base for animal husbandry research conducted by experts from agricultural universities in southwest China’s Yunnan Province and Inner Mongolia. 1. State Bank of India (SBI) has launched ‘Mobicash Mobile Wallet’ in association with state-owned telecommunications company Bharat Sanchar Nigam Ltd (BSNL). It will provide a mobile wallet to the masses and works with smart as well as normal feature phone. 2. The special feature of Mobicash is that users can deposit cash with BSNL retail outlets and can also withdraw cash from his/her account. The bank said the wallet will initially be available in Punjab, Rajasthan, Haryana and Bihar. The service will then be expanded on pan-India basis by December-end. 1. The Pradhan Mantri Garib Kalyan Yojana (PMGKY) is Union Government’s second income disclosure scheme (IDS) to allow tax evaders to come clean with unaccounted wealth. (PMGKY) notified along with other provisions of Taxation Laws (Second Amendment) Act, 2016 came into effect from 17 December 2016 and it will remain open until 31 March , 2017. 2. It provides for 50% tax and surcharge on declarations of unaccounted cash deposited in banks.The recently launched Garib Kalyan yojana, is similar to Income tax declaration scheme, however there are few differences. Under this scheme, tax rate will be higher and the declared income. 4. Pradhan Mantri Garib Kalyan Yojana Cess will be a special component under the income tax declaration scheme, where the payer needs to pay 33% surcharge on the tax levied.